Modern vacuum cleaners are equipped with two air filters: One protects the appliance’s motor by filtering the air that is sucked in, and the other protects the user’s lungs by preventing fine dust particles from exiting the exhaust. These filters need to be replaced regularly, but much less frequently than dust bags. Manufacturers that sell filters and dust bags separately, place the burden of keeping track of these replacements on the user. 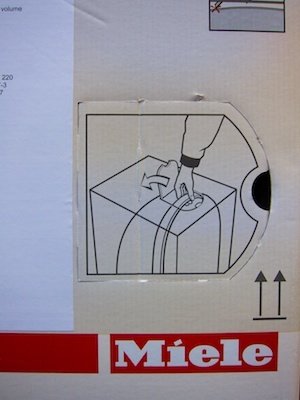 At least Miele makes their customers’ lives a bit easier by bundling filters with dust bags into one retail box. 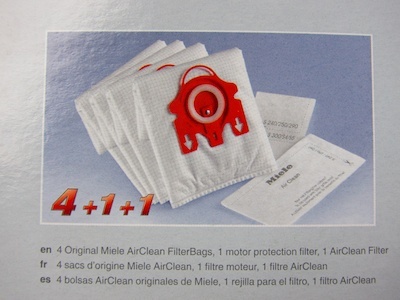 The box contains four dust bags and one each of the two filter types. An [exhaust] filter is supplied with every box of Miele dust bags. It should be replaced each time a new box of bags is started. A similar statement addresses the motor filter. There is one flaw in this design, though. Judging from the bundle, each filter should be good for use with four dust bags. By following Miele’s instructions of replacing the filters when you start a new box of dust bags, however, you would throw out the two factory-installed filters in a brand-new vacuum after filling just the one pre-installed dust bag. The fix? Don’t replace the filters when you start a new box of dust bags, but when you finish it. Carrying large and heavy cardboard boxes can be awkward. In some cases (no pun intended), the very contents inside the box can inspire a solution to this problem. We recently bought a new vacuum cleaner. At first glance, the box that the appliance came in definitely was of the awkward-to-handle variety. The designers of the packaging had come up with an ingenious idea to make it much more convenient to carry this large and heavy box. They had placed a little cut-out lid on the short side of the box right “above” the location of handle of the vacuum that was packaged inside. There is even a semi-circular hole to easily pull out the lid with a finger. 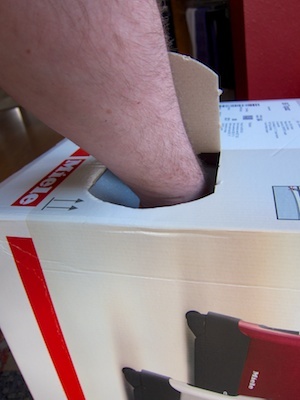 By reaching through the opened lid, you can get a solid grab on the vacuum’s handle, and carry the entire box and its contents around without too much hassle or effort. Progress bars are a staple of user interface design. They let you check the progress of a lengthier process — like copying a large file — with just a quick, cursory glance. And by observing how quickly the bar moves, you can intuitively estimate how long it will take for the process to complete. At London’s Heathrow airport, you can find progress bars in an unusual setting: Namely, on-board the shuttle buses that run between the airport’s five terminals. 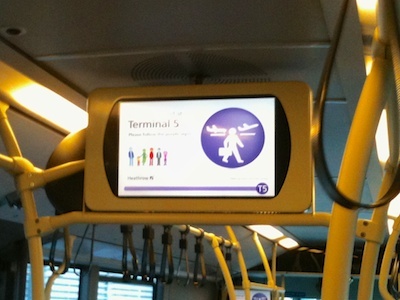 The buses feature monitors that display useful information on how to transfer between terminals. At he bottom of the screens, a progress bar visualizes the route from one terminal to another. The number of the destination terminal is shown at the end of the progress bar1. A nifty bus icon represents the vehicle’s current position along its route. Although the bus icon does not move along its path all that smoothly, seeing it progress at all does help ease that infamous “Are we there yet? !” feeling — especially when you’re worried about making your connection flight. Here’s an interesting detail: While the bus is moving, the display cycles through several different information screens. Once it approaches its destination, however, it settles on a single screen, which announces the terminal you’re just arriving at. 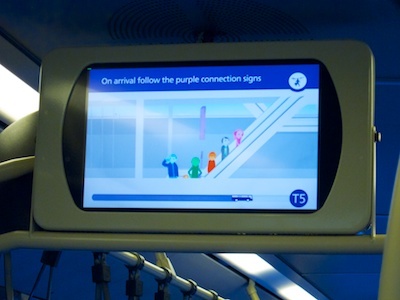 By making the display static towards the end of the journey, all passengers immediately get off the bus, instead of possibly blocking the aisle while waiting for another screen-full of information to appear.